We love a good dip. Give us crackers, bread, or even veggies, and we’ll scoop up a good dip and enjoy every single bite. The problem we have–and you might also–is the proportion of dip to the dipped…as in, we tend to take more dip per bite. We might as well just dig in with a spoon or a shovel, because that would be a pretty efficient way to eat this favorite of appetizers up. 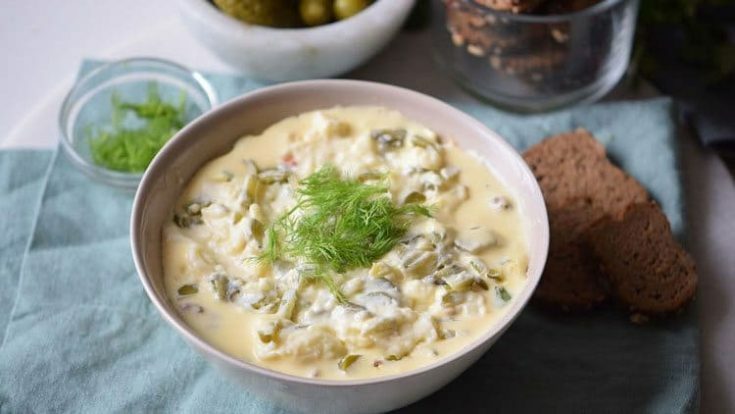 Whether you’re serving Dill Pickle Dip with an assortment of imported crackers, gluten-free crackers or artisan bread–or something altogether more simplistic, you’ll enjoy the fresh taste of dill seasoning in every last bite. If you’re hosting a party, you might consider a few of our other favorite dip recipes. We’re particularly fond of this Gluten Free Shrimp Dip, as well as our Black Bean Salsa, and Buffalo Chicken Dip. With great care, most recipes can be easily adapted to gluten-free and enjoyed by anyone on a gluten-free diet. In our household, we’ve dabbled in eating gluten free a time or two, but recently have started cooking gluten-free because of some health issues our daughter has been having over the last couple of months. She’s been through all sorts of testing to try to figure out what is causing her symptoms, to no avail. Unfortunately, sometimes tests don’t reveal the answers we are looking for. Being proactive is one of the most important things a parent can do in that situation. As a result, we’ve tried out a gluten and dairy-free diet for the last few weeks. We’ve just reintroduced dairy and accidentally included some gluten in a recipe…however, after eating the gluten it seems like her symptoms got a little worse again. It’s difficult to tell if gluten is the culprit or if her symptoms are overall getting a bit better. Needless to say, you’ll most likely be seeing many more gluten-free recipes on All She Cooks. In a bowl mix the cream cheese, olive oil, garlic, dill weed, sour cream, yogurt and vinegar. Pour the mixture in a saucepan over medium heat and add the pickles. Cook for 20 minutes stirring regularly. When ready to serve, top with a spoonful of dill sprigs. For a sweeter version, add some corn.